리우데자네이루의 볼거리와 사운드를 즐기고 싶다면 본 숙소(오를라 코파카바나 호텔)는 탁월한 선택입니다. 이 곳에서 생동감 넘치는 도시의 많은 것을 최대로 즐길 수 있습니다. 숙소가 Shopping Cassino Atlantico, 파크 가로타 드 이파네마, 무세우 역사 도 익서시토 에 포테 드 코파카바나 등과 인접한 위치에 있기에 지역의 관광 명소와 볼거리를 구경하기 위해 멀리 갈 필요가 없습니다. 본 숙소는 최고의 시설과 서비스 제공을 통해 투숙객이 편안함을 느끼도록 최선의 노력을 다하고 있습니다. 투숙객들은 숙소 내에서 Wi-Fi (무료/전 객실), 24시간 프런트 데스크, 여행 가방 보관, Wi-Fi (공공 장소), 룸서비스 등을 즐길 수 있습니다. 모든 숙소에는 편의 시설이 마련되어 있어 비할 데 없는 편안함을 선사합니다. 도시의 바쁜 일상 속 긴장을 풀 수 있게 도움을 주는 피트니스센터, 사우나, 실외 수영장, 일광욕실 등과 같은 환상적인 시설/활동을 이용할 수 있습니다. 편안하고 편리한 리우데자네이루의 숙소를 찾고 계신다면, 본 숙소(오를라 코파카바나 호텔)가 내 집처럼 편안한 공간이 될 것입니다. Right across from the beach. Location very nice. Pool however just for cooling down. way too small to swim. Breakfast area very cramped, although breakfast itself O.K. Great Location of the hotel. The staff had much to be desired not very friendly like I am use to but they werent rude. The hotel rooms were standard. The breakfast was great many many many choices. You couldnt beat the location and the rooftop pool area was nice. 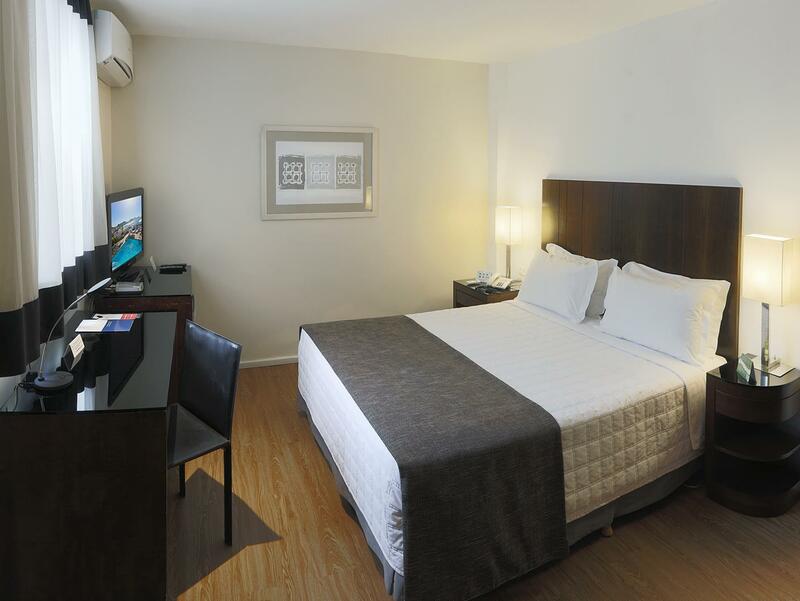 The hotel was modern and clean, the location is just across the road from the gorgeous beach. The roof terrace had sunbeds and parasols and a fantastic view of the bay,the pool however is much smaller than the pictures suggest.The room are spacious and very clean and the super king size bed was so comfortable. There was a large choice of breakfast - hot and cold and lots of fresh fruit. One niggle was that there was no choice of tea and hot water at the breakfast buffet table. 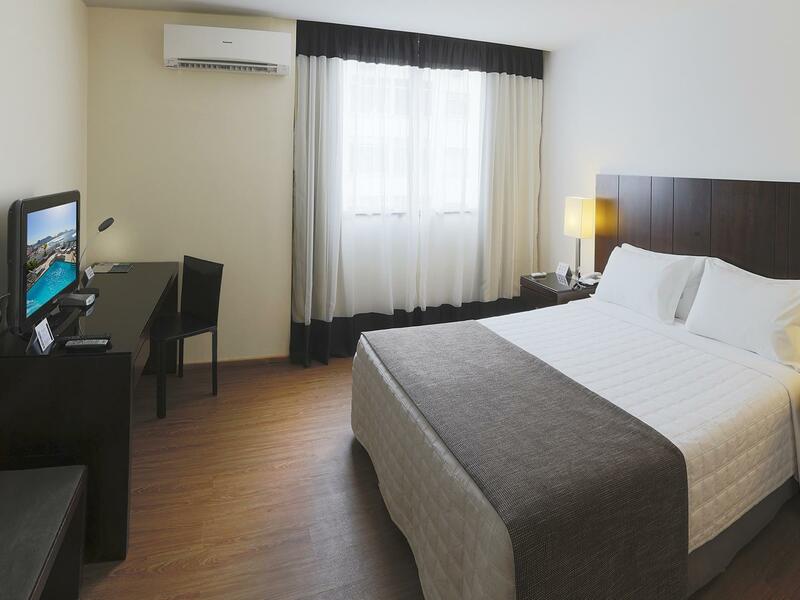 Basic, tired old rooms, The receptions and restaurant is cramped and congested and more suitable for a budget hostel. Avoid if on business travel. The dipping pool on the roof is nice and a quiet place to relax. Great view of copacabana. The only good thing about this hotel is the location,rooms are dark and small,the pool is tiny,the breakfast is poor and overcrowded. I and friends stayed at Orla Copacabana Hotel 5-8 July 2015. The rooms were so tiny, with only 1 bed that left no space to walk together. The rooms have small window facing to the back of very closed dirty surrounding buildings, feeling like in the jail. We could even hear adjacent room flushing toilet/TV's voices. No complimentary water. I've stayed here many times and keep on coming back. That must say it all. We loved our stay at the Orla hotel. The staff were really friendly and spoke fantastic english. The room was great and whilst we unfortunately didn't have a beach view we greatly enjoyed being out and about at the pool and in the gym which did have fantastic views. You are literally just accross the street from the famous Copacabana Beach and there is a surprise beach just around the corner which is even better for relaxing by during the day. Highly recommended! We enjoyed our stay at this nice, well priced and superbly located hotel, the un-friendly, un-smiling, un-cooperative manager was the only discordant note in this otherwise pleasant experience. Close to beach, friendly staff and breakfast! The hotel is a tall narrow building with no balconies overlooking the seafront. Our room was at the back with no view except concrete walls. The breakfast was great, the staff were friendly but overall we felt the hotel was expensive. Not bad. The hotel staffs are helpful and friendly. The room is reasonable. it just we stay in the room with no view. The toilet is small but clean. The location is good as there are many local resturant we can try. Nice friendly staff. The room was comfortable too. 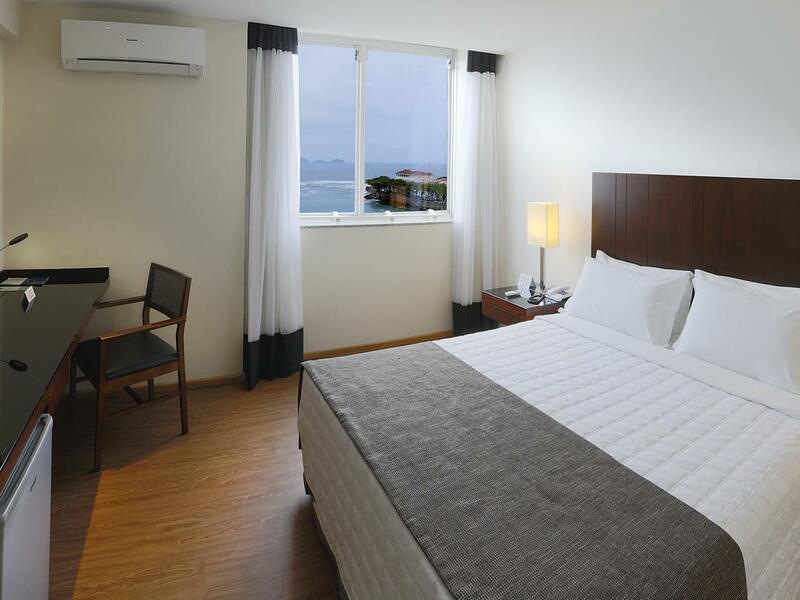 I enjoyed my stay on Copacabana beach and the price was decent for the time I year in which I was traveling. I would recommend this hotel to a friend. 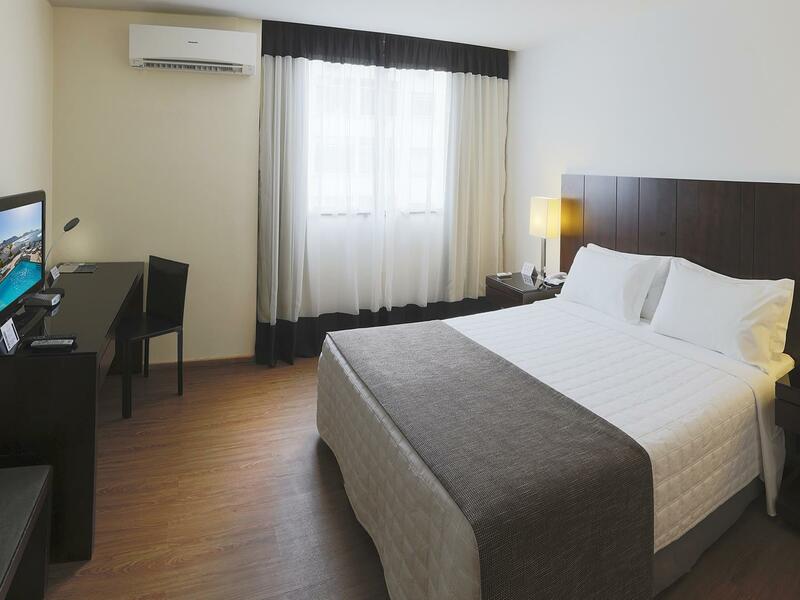 Good location at the end of Copacabana Beach and a short walk to Ipanema Beach. good beach location. overvalued for the small rooms. small, crowded breakfast room. slow elevators (one was broken for one of the three days we were there) with long waits, ended up using the stairs to climb 11 floors. friendly staff. the hotel offers free wi-fi at a speed that is so slow you are obliged to pay for the better connection. smelled of a rip off. i had an amazing stay at this hotel,, its right on the copacabana beach so its great for the day time relaxing on the beach, there are great views from the roof top of the hotel and the staff is extremely friendly and helpful,,, also a big bonus for me was that the reception staff spoke really good english which made my life a lot easier for booking tours etc,,.